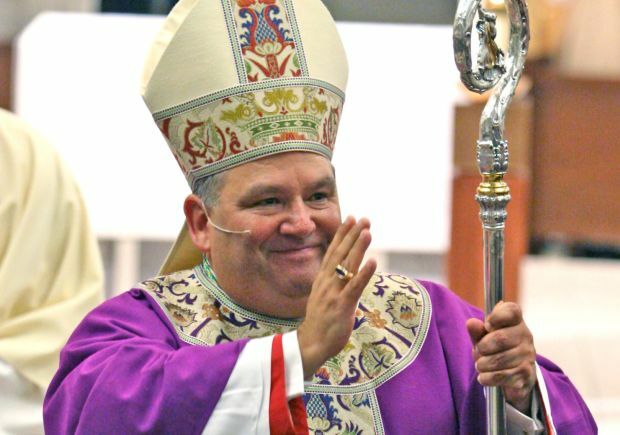 WASHINGTON (CNS) — Pope Francis has appointed Bishop Bernard A. Hebda of Gaylord, Mich., 54, to be coadjutor archbishop of Newark, N.J.
As coadjutor, he would automatically succeed Newark Archbishop John J. Myers, 72, upon his retirement or death. Canon law requires bishops to turn in their resignation to the pope at age 75. Archbishop Myers has headed the archdiocese since 2001. Archbishop Hebda, a native of Pittsburgh, was ordained bishop of Gaylord Dec. 1, 2009. The appointment was announced Sept. 24 in Washington by Archbishop Carlo Maria Vigano, apostolic nuncio to the United States. A Mass of welcome for Archbishop Hebda is to be celebrated Nov. 5 at the Cathedral Basilica of the Sacred Heart in Newark. Archbishop Myers introduced his coadjutor at a gathering of local journalists and archdiocesan employees and guests at the Newark Archdiocesan Center. “Considering some major projects to be implemented in the archdiocese, and the fact that three of us bishops in Newark are in our 70s, I had requested a coadjutor archbishop some time ago,” he said. “Archbishop Hebda has served generously and with distinction as a priest in Pittsburgh, as a monsignor in Rome, and as bishop of the Diocese of Gaylord,” Archbishop Myers said. He said the two have known each other over the years, in part from the Michigan bishop’s service at Pontifical Council for Legislative Texts; then-Msgr. Hebda began working with the council in the 1990s and was named its undersecretary in 2003. Archbishop Myers has been a consultor for the council and is now a full member. “We have been friends and collaborators for years. I happily look forward to our increased collaboration for the benefit of the faithful of the Archdiocese of Newark, in the years ahead,” he concluded. Archbishop Hebda said: “If you’re wondering if I am as surprised as you are by this appointment, the answer is ‘yes,’ and yet I am truly thrilled to be here to begin my service. “I am particularly grateful for the kind words of Archbishop Myers and for the presence of the auxiliary bishops, as well as the kindness and hospitality that they have already offered to me,” he said. The archdiocese’s four active auxiliary bishops are: Bishops Edgar M. da Cunha, Thomas A. Donato, John W. Flesey and Manuel A. Cruz. “I am humbled by Pope Francis’ confidence in calling me to this local church, renowned for its generous pastoral outreach to those who have come to these shores and its consistently passionate response to the call to live out the Gospel,” the new coadjutor said. The four-county Newark Archdiocese has 1.5 million Catholics out of a total population of about 3 million people. “I am also grateful to Pope Francis for providing me with the ‘coadjutor’s cushion,’ an opportunity to experience the vitality of this local church and its challenges before ever being placed at the helm,” Archbishop Hebda said. Archbishop Myers outlined a number of projects that will have the help of Archbishop Hebda. For example, he will take strategic roles alongside Archbishop Myers in the coming years on “Lighting the Way,” a realignment of the system of Catholic elementary schools of the archdiocese; development efforts to prepare for the future and improve some archdiocesan programs; and continued refinement and attention to parishes through the New Energies Parish Initiative. The initiative involves the clergy and people of the archdiocese in addressing the demographic changes taking place within the churches of the four counties of the archdiocese. Archbishop Hebda, 54, is a native of Pittsburgh who received a bachelor’s degree in government in 1980 from Harvard University and a law degree from Columbia University School of Law in New York in 1983. He practiced law in a Pittsburgh law firm before entering the seminary. He entered St. Paul Seminary in Pittsburgh in 1984 and completed his theological studies at North American College in Rome. In 1988, he was ordained to the priesthood in Pittsburgh where he served in a variety of assignments including parish ministry, tribunal work, and campus ministry. In 1990 he earned a canon law degree; six years later he was appointed to work in the Vatican at the Pontifical Council for Legislative Texts. He has served as a member of the U.S. Conference of Catholic Bishop’s Committee for the Protection of Children and Young People and currently serves on the Committee on Canonical Affairs and Church Governance. He also serves as the episcopal liaison for the National Catholic Student Coalition. By Vatican appointment, he is a member of the executive board of Caritas International and a consultor for the Pontifical Council for Legislative Texts. “What wasn’t to love? I would have been happy to spend the rest of my days here laboring in the vineyard at your side,” he added. Archbishop Myers, a native of Ottawa, Ill., has headed the Newark Archdiocese since he was installed in October 2001. He is president of the New Jersey Catholic Conference, the public policy arm of the Catholic Church in New Jersey. Earlier this year, he faced criticism over the archdiocese’s handling of the case of Father Michael Fugee, an archdiocesan priest who had agreed not to have unsupervised contact with minors but was found to be working with youngsters. The priest is resigned from active ministry in May. The archbishop investigated and sought the resignation of the vicar general for mishandling case. Archbishop Myers said the archdiocesan official’s resignation was one of several steps being taken to strengthen the archdiocese’s response to sexual abuse. On the national level, Archbishop Myers has served on or chaired numerous U.S. bishops’ committees, initiatives and task forces: canonical affairs; shrines and pilgrimages; vocations; Hispanic affairs; and what is now called the Committee for the Protection of Children and Young People.